Soundscape commentaries are now being heard on long-distance coach journeys throughout Europe. They explain about the history and culture of places being passed along the route in a light, entertaining way and aim to bring audio magic to what can be otherwise long, boring stretches of road. Soundscape commentaries are expertly researched, written and produced using multiple voice, music and sound effects. 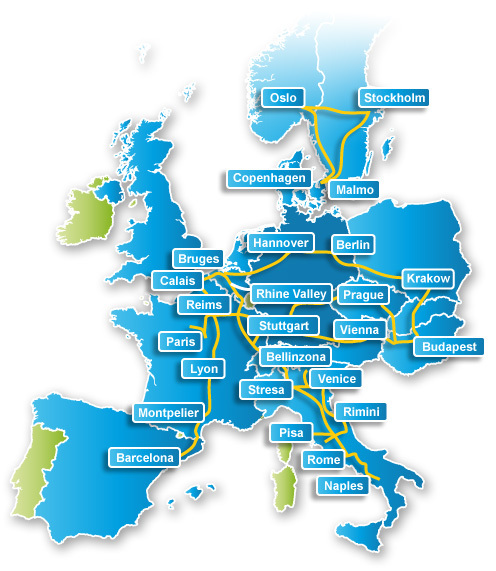 Our European commentaries begin at Calais and include routings to Paris, Oslo, Stockholm, Copenhagen, Berlin, Wroclaw, Budapest, Munich, Salzburg, Vienna, Metz, Basel, Rome, Sorrento, Lyon, Montpellier and Barcelona.